Background: Small intestinal bacterial overgrowth (SIBO) has been proposed to be common in irritable bowel syndrome (IBS), with altered small-bowel motility as a possible predisposing factor. Aim: To assess the prevalence of SIBO, by culture of small-bowel aspirate, and its correlation to symptoms and motility in IBS. Methods: 162 patients with IBS who underwent small-bowel manometry and culture of jejunal aspirate were included. Cultures from 26 healthy subjects served as controls. Two definitions of altered flora were used: the standard definition of SIBO (⩾105 colonic bacteria/ml), and mildly increased counts of small-bowel bacteria (⩾95th centile in controls). Results: SIBO (as per standard definition) was found in 4% of both patients and controls. Signs of enteric dysmotility were seen in 86% of patients with SIBO and in 39% of patients without SIBO (p = 0.02). Patients with SIBO had fewer phase III activities (activity fronts) than patients without SIBO (p = 0.08), but otherwise no differences in motility parameters were seen. Mildly increased bacterial counts (⩾5×103/ml) were more common in patients with IBS than in controls (43% vs 12%; p = 0.002), but this was unrelated to small intestinal motility. No correlation between bacterial alterations and symptom pattern was observed. Conclusions: The data do not support an important role for SIBO according to commonly used clinical definitions, in IBS. However, mildly increased counts of small-bowel bacteria seem to be more common in IBS, and needs further investigation. Motility alterations could not reliably predict altered small-bowel bacterial flora. The irritable bowel syndrome (IBS) is a common disorder in Western populations,1 and so far many pathophysiological mechanisms have been considered. Recently, small intestinal bacterial overgrowth (SIBO) has been proposed to be an important factor, with prevalence figures of 38–84% in patients with IBS.2–4 However, these results were obtained using hydrogen breath tests, which are indirect tests of SIBO with poor sensitivity and specificity.5,6 So far, no studies have assessed systematically the prevalence of SIBO in IBS using a direct test—that is, bacterial cultures of aspirate from the small bowel. Opinions regarding the preferred diagnostic test for SIBO are conflicting. Many regard aspiration and direct culture of jejunal contents as the gold standard,5,13,14 even though the limited reach of the instrumentation leaves cases with isolated distal SIBO undiagnosed.15,16 However, evidence of the existence and clinical relevance of culture-proven ileal bacterial overgrowth is lacking. In addition, there is no consensus on the definition of a positive culture. SIBO is usually defined as a total growth of ⩾105 cfu/ml of intestinal fluid.5,17 However, this definition includes Gram-positive flora, in turn including upper respiratory flora, which has not been correlated with the symptoms of SIBO.18,19 Growth of colonic bacteria (mainly Gram negatives, strictly anaerobes and enterococci) correlates with symptoms of SIBO.20,21 Therefore, the definition of SIBO as ⩾105 colonic bacteria seems to be more clinically relevant. Therefore, the aim of our study was to determine the prevalence of SIBO in a large sample of patients with IBS by culture of small-bowel aspirate. Moreover, we also wanted to evaluate whether overgrowth of bacteria in these patients could be related to small-bowel motility characteristics, and to the symptom profile of the patients. After we had commenced our study, Pimentel et al2,3,24 reported some of the findings mentioned above. Because of this, GHBT and LHBT were performed in a number of patients with negative small-bowel cultures. We recruited patients with a clinical diagnosis of IBS, based on the ROME II criteria,32 referred to our outpatient clinic because of symptoms refractory to standard treatment. During 1999–2004, we included 162 patients (mean (range) age 38 (19–68) years; 120 women) and divided them into subgroups on the basis of their predominant bowel habit, yielding 49 patients with diarrhoea-predominant IBS (IBS-D), 37 with constipation-predominant IBS and 76 with alternating-type IBS (IBS-A). We also recruited 42 healthy volunteers (mean (range) age 40 (20–79) years; 22 women) without any history of gastrointestinal symptoms. No subjects had been treated with antibiotics within 2 weeks before the study, and drugs known to affect the gastrointestinal tract were not allowed within 48 h of the study. All subjects gave informed consent, and the study was approved by the ethics committee of the University of Göteborg (Göteborg, Sweden). Antroduodenojejunal manometry was recorded after an overnight fast. The manometry catheter was placed under fluoroscopic guidance, with the tip in the proximal part of the jejunum, as described in more detail previously.33 Interdigestive motility was recorded for 3 h. A test meal (500 kcal) was then given, and the recording continued for another hour. At the end of the procedure, jejunal aspirate for culture was obtained via the central lumen of the manometry catheter. Hydrogen breath tests (glucose and lactulose) were added to the protocol during the course of the study, as studies reporting high prevalence of SIBO in IBS using these methods had been published,2,3,24 and all subjects with negative cultures during 2003–4 were asked to undergo these tests. GHBT and LHBT were carried out on separate mornings after an overnight fast. Motility was recorded using an eight-channel assembly for pressure recording (Zinetics, Salt Lake City, Utah, USA). The water-perfused catheter had an outside diameter of 4.8 mm, a central lumen with a diameter of 1.8 mm for the guidewire and eight lumens with a diameter of 0.8 mm each for pressure recording. The pressure recording side ports were situated at 2, 17, 30, 32, 34, 45.5, 47 and 48.5 cm from the tip. 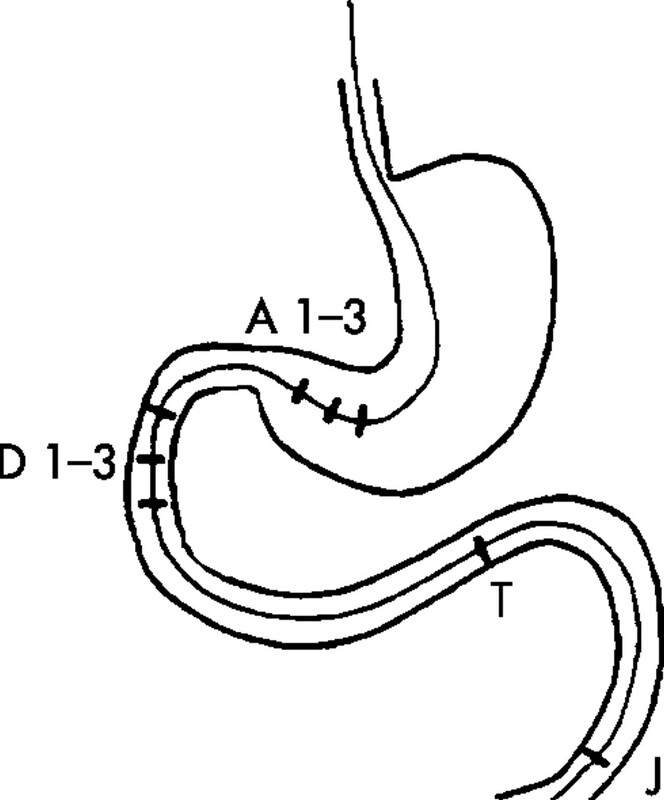 Thus, three ports were situated in the antrum 1.5 cm apart (A1–3), three in the descending part of the duodenum 2 cm apart (D1–3), one in the distal duodenum close to the ligament of Treitz (T) and one in the proximal jejunum (J; fig 1). The eight channels were connected to capillaries, and each channel was perfused under a low-compliance condition with water at 0.3 ml/min. The catheter was connected to pressure transducers and recorded with a polygraph (PC Polygraph, Synetics, Stockholm, Sweden). The information was transformed to a computer via a fibreoptic interface. The individual recordings were displayed on the computer screen and stored for later analysis. Schematic picture of the manometric catheter with eight pressure-recording ports: three in the antrum (A1–3), three in the descending duodenum (D1–3), one close to the ligament of Treitz (T) and one in the proximal jejunum (J). Jejunal juice was aspirated via the central lumen of the manometry catheter and collected in a sterile plastic tube. The samples were sent to a microbial laboratory within 2 h, and cultured for aerobic and anaerobic bacteria on blood agar plates with 4% defibrinated horse blood in aerobic and anaerobic atmospheres of N2 and 10% CO2. Selective cultivation of Gram-negative strains was performed on Drigalski agar under aerobic conditions. Yeast fungus was cultured on Sabouraud’s agar. The minimum incubation time was 48 h. Identification of the microorganisms was based on colony characteristics, Gram staining, biochemical and chromatographic tests. Quantification was performed by counting the number of colony-forming units (cfu/ml). Culture-verified SIBO was defined as ⩾105 cfu/ml of colonic bacteria. These patients were given appropriate open-label antibiotics for 10 days, and the severity of symptoms was assessed on a seven-grade Likert scale assessing a number of IBS symptoms before and after therapy. These subjects also underwent a second manometry within 2 weeks after treatment. For explorative analyses, we also looked at lower cut-off levels, including non-colonic bacteria, as well as bacterial counts ⩾95th centile in our healthy volunteers, to represent increased counts of small-bowel bacteria. The manometric data were reviewed in regard to the characteristics of phase III, migrating motor complex (MMC), motility indices, postprandial motor pattern and presence of enteric dysmotility. Analysis of the different phases of interdigestive motility was performed by direct visual inspection on the computer screen. The number of phase III activities of the MMC was counted and presented as the average number per 3 h, and the duration of phase III was measured. The MMC cycles were analysed qualitatively and quantitatively with a commercially available program (Polygram, V.5.06 X1, Synetics Medical, Stockholm, Sweden). The area under the curve was used as motility index, expressed as millimeters of mercury (mm Hg)×seconds(s), and calculated for the last 30 min of phase II (late phase II), and for 30 min after the subjects had finished their meal. The following recording points were used for calculation of motility index in the four segments studied: A3, D2, T and J (fig 1). The propagation velocity of phase III from proximal to distal duodenum and from distal duodenum to jejunum was analysed with a computerised calculation after manual marking on the computer screen (cm/min). Comparisons within the IBS group were made using paired and unpaired non-parametric analyses (Wilcoxon’s test and Mann–Whitney U test). The number of positive tests on small-bowel culture, LHBT and GHBT, using different definitions in patients with IBS versus controls, were compared using χ2 test. Changes in H2 over time during the LHBT were compared between controls and patients with IBS, and analysed using repeated-measures analysis of variance. A significance level of 0.05 was accepted. The cultures were obtained from 162 patients with IBS (mean age: 38 years; 120 women) and 26 controls (mean age: 40 years; 15 women). Few subjects had completely sterile cultures, and most subjects had cultures with low counts (101–3) of yeast fungus, and/or respiratory/oral flora. In all, 7 (4%) patients had jejunal cultures showing bacterial overgrowth, with ⩾105 cfu/ml colonic bacteria (mean (range) age 49 (34–67) years; 5 women; table 1). In addition, three patients had cultures with 105, 5×105 and 106 cfu/ml of Staphylococcus aureus. This was not significantly different from the control group, in which 1 (4%) healthy volunteer had a culture with 5×105Enterococci/ml (woman aged 71 years). The 95th centile in our control group was 5×103 cfu/ml of any bacteria (respiratory and oral flora excluded). Mildly increased counts of small-bowel bacteria were more common in patients with IBS than in controls. Cultures with ⩾104 cfu/ml were found in 24% of the patients with IBS compared with 4% in controls (p = 0.02), and cultures with ⩾5×103 cfu/ml were observed in 43% vs 12% (p = 0.002; table 2). Several different organisms were found in these cultures, non-fermentative Gram-negative Bacilli and Enterobacter being the most common. In all, 54 patients with IBS with <105 colonic bacteria/ml (mean age: 39 years; 42 women) and 20 controls (mean age: 39 years; 10 women) underwent a GHBT. No healthy volunteer and only one patient had a positive test indicating SIBO (fig 2). The culture from this patient showed only respiratory tract flora (103 cfu/ml). Percentages of subjects with tests indicating altered small-bowel flora according to the different diagnostic methods and definitions used; jejunal culture (⩾105 and ⩾5×103 cfu/ml), glucose hydrogen breath test (GHBT), lactulose hydrogen breath test (LHBT) with two distinct H2 peaks after ingestion of lactulose (LHBT double peak), LHBT with a rise in H2 within 90 min (LHBT 90 min), and LHBT with a rise in H2 within 180 min (LHBT 180 min). IBS, irritable bowel syndrome. **p<0.01. A total of 46 patients with <105 colonic bacteria/ml (mean age: 40 years; 34 women) and 21 controls (mean age: 39 years; 10 women) underwent an LHBT. In all, 7 (15%) patients and 4 (20%) controls had a positive test using the double-peak definition (p = NS). Of the patients with a positive LHBT, three had bacterial counts of 5×103, 104 and 5×104 cfu/ml, respectively, but none had growth of colonic bacteria ⩾5×103 cfu/ml. A 20 ppm rise in H2 within 90 min was observed in 35% of the patients and in 45% of the controls (p = NS). A 20 ppm rise in H2 within 180 min was observed in 78% of the patients and in 70% of the controls (p = NS; fig 2). No significant differences were observed when comparing the rise in H2 over time between patients and controls (fig 3). 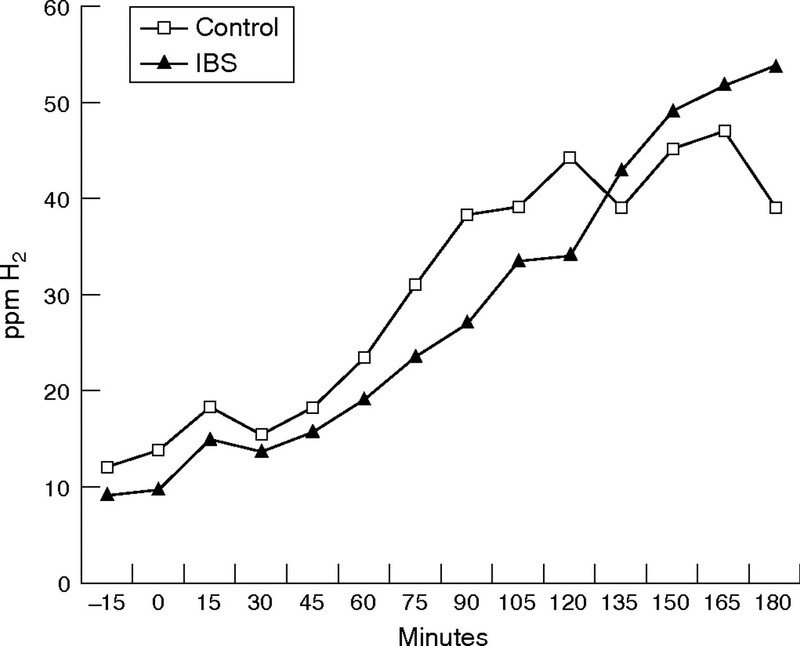 Rise in hydrogen (H2) over time in patients with irritable bowel syndrome (IBS) and in controls, expressed as a group mean, during the lactulose hydrogen breath test. ppm, parts per million. Conventional manometric evaluation in the 162 patients discovered motor abnormalities suggesting enteric dysmotility (box 1) in 86% (6/7) of the patients with culture-positive SIBO (⩾105 cfu/ml of colonic bacteria), compared with 39% of the patients without SIBO (p = 0.02). A more extended analysis of small-bowel motility, as described in Materials and methods, was performed in patients with SIBO (n = 7) and in 74 of the patients without SIBO (mean age: 39 years; 52 women). The patients with culture-proven SIBO tended to have fewer phase III activities than those without SIBO (0.6 (0–1.8) vs 1.2 (0–4)/3 h; median (range); p = 0.08). Otherwise, no group differences were observed for the remaining analysed motility parameters, such as phase III duration, propagation velocity, MMC cycle length or motility index (table 3). The manometry results for the patients with mildly increased bacterial counts (⩾5×103 cfu/ml) were not different from those for the patients with <5×103 cfu/ml (data not shown). The manometry findings before and after antibiotic treatment in patients with SIBO did not show any differences in the presence of enteric dysmotility or in any of the other motility parameters evaluated (table 3). Small intestinal overgrowth did not correlate with IBS subtype with regards to the predominant bowel habit. Of the seven patients with SIBO, three had constipation-predominant IBS, two had diarrhoea-predominant IBS and two had alternating-type IBS. They were all treated with antibiotics (ciprofloxacin 500 mg twice a day for 10 days). Cultures after treatment showed decreased levels of bacteria in five patients after treatment, and four patients still fulfilled the standard definition for SIBO. Three patients reported ⩾25% improvement in symptoms compared with that before treatment (table 1). However, being a responder was unrelated to IBS subtype, as well as to bacterial counts after treatment. We found SIBO, only in a small subset of patients with IBS (4%), diagnosed by jejunal cultures, using the definition of ⩾105 cfu/ml of colonic bacteria. This was not different from controls without gastrointestinal symptoms. However, cultures with ⩾5×103 and ⩾104 cfu/ml were more frequently seen in patients with IBS than in controls. We could not identify a specific motor pattern predicting SIBO, even though these patients tended to have fewer activity fronts, and signs of enteric dysmotility were more common. These manometric abnormalities were not more common in patients with mildly increased bacterial counts. Moreover, similar proportions of positive LHBT and GHBT were obtained in patients with IBS and controls, regardless of how we defined a positive test. In agreement with some earlier studies,27–29 our findings do not confirm a strong association between IBS and SIBO as proposed by others,2–4,40 even though the relevance of minor alterations of the bacterial flora in the upper gut is unclear. Pimentel et al2,3 have reported on SIBO diagnosed by means of LHBT in 78–84% of patients with IBS. We found SIBO in 4% of patients with IBS, defined as ⩾105 cfu/ml of colonic bacteria, which is the definition most clearly associated with gastrointestinal symptoms.20,21 The reliability of our findings from the jejunal cultures is supported by the results from the GHBT, for which only 1 of 54 patients had a positive test. Similarly, previous studies using the GHBT and 14C-xylose test have failed to show a high prevalence of abnormal tests in IBS.28,29 Our results from the LHBT, using the double-peak definition, with 15% positive tests in patients are in agreement with Walters et al,29 who observed positive LHBT in 10% of patients with IBS. The discrepancy between Pimentel et al’s3 findings and ours may partly be due to the use of different assessment methods, definitions and inclusion criteria. We could not measure expiratory methane, which has been reported to be important in constipation-predominant IBS (23% of our patients). Therefore, the breath tests of possible methane-producing patients would be interpreted as being normal—that is, false negative. At least in their first study, Pimentel et al2 identified Rome I-positive patients with IBS using a questionnaire among patients initially referred for LHBT. This could perhaps explain the high prevalence of abnormal tests. Our patients also constitute a selected group of patients, as they were referred to our unit due to symptoms refractory to standard treatment. Based on this selection bias, neither our results nor the results of Pimentel et al3 could be generalised to all patients with IBS. When we applied the criteria for an abnormal LHBT with a single peak H2 within 90 or 180 min, the prevalences of abnormal tests were found to be 35% and 78%, respectively. Also, when using these definitions, we could not, similarly to Walters et al,29 demonstrate an increased prevalence of positive tests in patients with IBS relative to controls. Supported by one study combining LHBT with scintigraphy, enabling anatomical location of the lactulose bolus,22 this late H2 rise is probably due to physiological variations in transit, reflecting colonic fermentation, and not due to bacteria in the small bowel.30 Abnormal colonic fermentation has been reported in IBS,42 and therapies that modify the gut flora may improve symptoms in some patients.26,27,43 Studies on patients with IBS showing symptom improvement after antibiotic treatment2,3,25 have been used to further support the conclusion that SIBO is a pathophysiological factor in IBS.15 However, an antibiotic-sensitive pathophysiology in IBS may be explained by alterations of colonic bacterial flora25,27,30 resulting in symptom improvement. In bacterial overgrowth caused by delayed transit, antibiotics produce prompt improvements.44,45 About half of the patients with SIBO in our study reported symptom improvement after antibiotic treatment. Unfortunately, our sample was too small to perform a randomised placebo-controlled evaluation. We do not have data on antibiotic use before 2 weeks of the study, or on the last use of antibiotics. The time for recolonisation of the small bowel could possibly be >2 weeks. However, this study was conducted in a setting where antibiotics are not available over-the-counter, and Sweden is a low consumer of antibiotics compared with other European countries.46 Moreover, we have no reason to believe that patients with IBS would use more antibiotics than healthy subjects. It has been argued that direct culture is not sufficient to detect SIBO, as sampling is restricted to one location in the proximal small bowel, missing more distal overgrowth.15 As lactulose is not absorbed in the small bowel, LHBT is supposed to be superior in detecting distal bacterial overgrowth.2,3 However, the clinical relevance of such findings is questionable, as the distal ileum is normally colonised with 105–8 cfu/ml.10,11 Furthermore, it is a common belief that cultures are often false negative, especially concerning obligate anaerobes,11 and modern molecular identification techniques have identified several unculturable bacteria.47 Our aspirates were not immediately incubated, but even strict anaerobic bacteria are thought to tolerate at least 8 h in an environment that is not depleted of oxygen.48 The aspirates were obtained after a meal and a water-perfused manometry. The amount of bacteria in the proximal gastrointestinal tract is thought to increase soon after a meal,11 whereas the water-perfused manometry could instead result in a dilution and a lower count of bacteria. However, none of these explanations are likely to explain the differences seen between patients with IBS and controls. Few of the cultures were completely negative, possibly indicating contamination with oral flora, which is known to be common.49 The patients tended to have higher counts of bacteria, possibly owing to a slightly impaired ability to rinse the upper bowel of bacteria in IBS, as suggested previously.15,24 In line with this, the patients with culture-verified SIBO had fewer phase III activities, which is thought to be one of the most important mechanisms in the protection against colonisation by rinsing the bowel.7,8 Most of the patients also had enteric dysmotility, as defined by the criteria in box 1. However, this was also seen in several patients without SIBO, making it impossible to predict the presence of overgrowth just by analysis of the small-bowel motility patterns. We did not perform a formal correlation analysis between the amount of bacteria and the degree of abnormality of MMC, as this cannot be easily quantified. The duration of our manometry recordings were, for practical reasons, relatively short, possibly diminishing the clinical value of our manometries, and of course a possibility that a longer recording time could have discovered an even larger proportion of patients with motor abnormalities. Moreover, the short duration of our recording also made it impossible to assess the cycle length of the MMC in subjects without or with one phase III activity during the 3 h recording. However, the lack of group differences is unlikely to be explained by this. Except for impaired motility, failure of the gastric-acid barrier is also known to predispose to bacterial colonisation in the small bowel.7 No drugs known to affect the gastrointestinal tract were allowed within 48 h before the study. However, prior to this, we did not control for use of proton pump inhibitors or other antacids that could affect the bacterial flora of the intestine.50,51 One might expect the use of these drugs to be more frequent in patients with IBS, considering the high overlap with functional dyspepsia.1 This could be one explanation for alterations in the gut flora in patients with IBS, even though our study did not assess this in detail. The importance of mildly increased small-bowel bacteria seen in IBS is unclear. This could just be an epiphenomenon due to altered motility. The bacteria could also be the cause of the observed motility alterations. To some extent, the fact that there were no significant differences in the motility parameters before and after treatment speaks against this. However, only seven patients with SIBO were evaluated, and four patients still fulfilled the criteria for SIBO after treatment. Further studies are needed to better characterise these bacterial alterations in IBS, including possible correlations to symptoms. Altered counts of bacteria could induce a low-grade inflammation, which also needs to be assessed in further studies looking at both systemic and local inflammatory activity, together with an evaluation of the presence of post-inflammatory IBS. In conclusion, using several diagnostic methods including culture of jejunal aspirate and hydrogen breath tests, our results do not support a strong association between IBS and SIBO according to the standard definition. Most patients with high counts of bacteria were found to have minor uncharacteristic motility alterations, which may have been a predisposing factor in these cases. Of interest, but of uncertain relevance, a significant subset of patients with IBS seem to have mildly increased counts of bacteria in the upper gut. This finding, and the correlation with symptoms in IBS, needs to be evaluated in further studies. Agréus L, Svärdsudd K, Nyrén O, et al. Irritable bowel syndrome and dyspepsia in the general population: overlap and lack of stability over time. Gastroenterology1995;109:671–80. Pimentel M, Chow EJ, Lin HC. Normalization of lactulose breath testing correlates with symptom improvement in irritable bowel syndrome. A double-blind, randomized, placebo-controlled study. Am J Gastroenterol2003;98:412–19. McCallum R, Schultz C, Sostarich S. Evaluating the role of small intestinal bacterial overgrowth (SIBO) in diarrhea predominant IBS (IBS-D) patients utilizing the glucose breath test. Gastroenterology2005;128:T1118. Corazza GR, Menozzi MG, Strocchi A, et al. The diagnosis of small bowel bacterial overgrowth. Reliability of jejunal culture and inadequacy of breath hydrogen testing. Gastroenterology1990;98:302–9. Stotzer P - O, Simrén M. Use and abuse of hydrogen breath tests. Gut2006;55:297–303. Husebye E, Skar V, Hoverstad T, et al. Abnormal intestinal motor patterns explain enteric colonization with gram-negative bacilli in late radiation enteropathy. Gastroenterology1995;109:1078–89. Vantrappen G, Janssens J, Hellemans J, et al. The interdigestive motor complex of normal subjects and patients with bacterial overgrowth of the small intestine. J Clin Invest1977;59:1158–66. Stotzer PO, Björnsson ES, Abrahamsson H. Interdigestive and postprandial motility in small-intestinal bacterial overgrowth. Scand J Gastroenterol1996;31:875–80. Gorbach SL. Intestinal microflora. Gastroenterology1971;60:1110–29. Drasar BS, Shiner M, McLeod GM. Studies on the intestinal flora. I. The bacterial flora of the gastrointestinal tract in healthy and achlorhydric persons. Gastroenterology1969;56:71–9. Simon GL, Gorbach SL. Intestinal flora in health and disease. Gastroenterology1984;86:174–93. King CE, Toskes PP. Comparison of the 1-gram [14C]xylose, 10-gram lactulose-H2, and 80-gram glucose-H2 breath tests in patients with small intestine bacterial overgrowth. Gastroenterology1986;91:1447–51. Bauer TM, Schwacha H, Steinbruckner B, et al. Diagnosis of small intestinal bacterial overgrowth in patients with cirrhosis of the liver: poor performance of the glucose breath hydrogen test. J Hepatol2000;33:382–6. Lin HC. Small intestinal bacterial overgrowth: a framework for understanding irritable bowel syndrome. JAMA2004;292:852–8. Rumessen JJ, Gudmand-Hoyer E, Bachmann E, et al. Diagnosis of bacterial overgrowth of the small intestine. Comparison of the 14C-D-xylose breath test and jejunal cultures in 60 patients. Scand J Gastroenterol1985;20:1267–75. Kerlin P, Wong L. Breath hydrogen testing in bacterial overgrowth of the small intestine. Gastroenterology1988;95:982–8. MacMahon M, Lynch M, Mullins E, et al. Small intestinal bacterial overgrowth—an incidental finding? J Am Geriatr Soc1994;42:146–9. Lipski PS, Kelly PJ, James OF. Bacterial contamination of the small bowel in elderly people: is it necessarily pathological? Age Ageing1992;21:5–12. Donaldson RM Jr. Role of enteric microorganisms in malabsorption. Fed Proc1967;26:1426–31. King CE, Toskes PP. Small intestine bacterial overgrowth. Gastroenterology1979;76:1035–55. Riordan SM, McIver CJ, Walker BM, et al. The lactulose breath hydrogen test and small intestinal bacterial overgrowth. Am J Gastroenterol1996;91:1795–803. Corazza G, Strocchi A, Sorge M, et al. Prevalence and consistency of low breath H2 excretion following lactulose ingestion. Possible implications for the clinical use of the H2 breath test. Dig Dis Sci1993;38:2010–16. Pimentel M, Soffer EE, Chow EJ, et al. Lower frequency of MMC is found in IBS subjects with abnormal lactulose breath test, suggesting bacterial overgrowth. Dig Dis Sci2002;47:2639–43. Nayak AK, Karnad DR, Abraham P, et al. Metronidazole relieves symptoms in irritable bowel syndrome: the confusion with so-called ‘chronic amebiasis’. Indian J Gastroenterol1997;16:137–9. Dear KL, Elia M, Hunter JO. Do interventions which reduce colonic bacterial fermentation improve symptoms of irritable bowel syndrome? Dig Dis Sci2005;50:758–66. Sharara AI, Aoun E, Abdul-Baki H, et al. A randomized double-blind placebo-controlled trial of rifaximin in patients with abdominal bloating and flatulence. Am J Gastroenterol2006;101:326–33. Parisi G, Leandro G, Bottona E, et al. Small intestinal bacterial overgrowth and irritable bowel syndrome. Am J Gastroenterol2003;98:2572. Walters B, Vanner SJ. 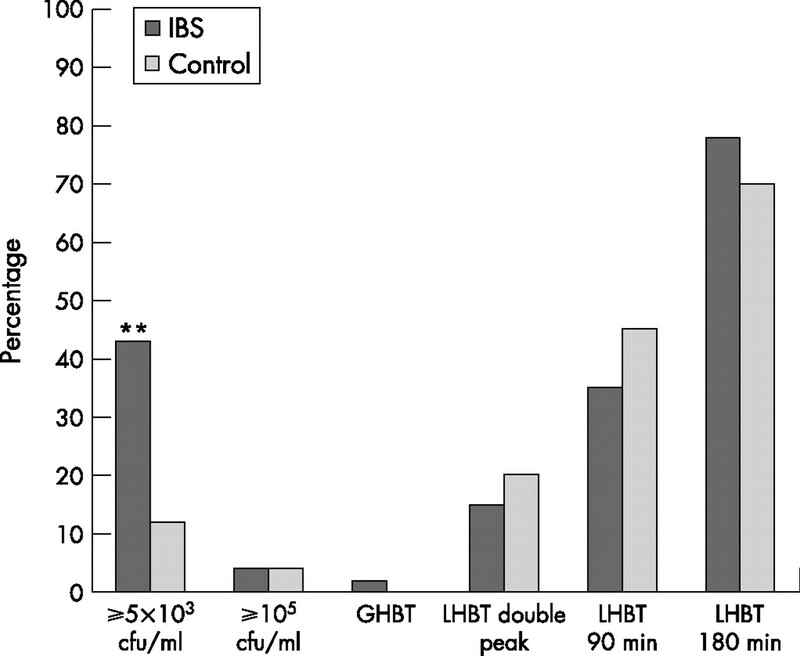 Detection of bacterial overgrowth in IBS using the lactulose H2 breath test: comparison with 14C-D-xylose and healthy controls. Am J Gastroenterol2005;100:1566–70. Riordan SM, McIver CJ, Duncombe VM, et al. Small intestinal bacterial overgrowth and the irritable bowel syndrome. Am J Gastroenterol2001;96:2506–8. Hasler WL. Lactulose breath testing, bacterial overgrowth, and IBS: just a lot of hot air? Gastroenterology2003;125:1898–900. Thompson WG, Longstreth GF, Drossman DA, et al. Functional bowel disorders and functional abdominal pain. Gut1999;45 (Suppl 2) :II43–7. Björnsson ES, Abrahamsson H. Interdigestive gastroduodenal manometry in humans. Indication of duodenal phase III as a retroperistaltic pump. Acta Physiol Scand1995;153:221–30. Rhodes JM, Middleton P, Jewell DP. The lactulose hydrogen breath test as a diagnostic test for small-bowel bacterial overgrowth. Scand J Gastroenterol1979;14:333–6. Wingate D, Hongo M, Kellow J, et al. Disorders of gastrointestinal motility: towards a new classification. J Gastroenterol Hepatol2002;17 (Suppl) :S1–14. Stanghellini V, Camilleri M, Malagelada JR. Chronic idiopathic intestinal pseudo-obstruction: clinical and intestinal manometric findings. Gut1987;28:5–12. Kellow JE. Small intestine: normal function and clinical disorders. In: Schuster MM, Crowell MD, Koch KL, eds. Schuster atlas of gastrointestinal motility in health and disease. 2nd edn. Hamilton: BC Decker, 2002:219–36. Simrén M, Castedal M, Svedlund J, et al. Abnormal propagation pattern of duodenal pressure waves in the irritable bowel syndrome (IBS). Dig Dis Sci2000;45:2151–61. Husebye E. The patterns of small bowel motility: physiology and implications in organic disease and functional disorders. Neurogastroenterol Motil1999;11:141–61. Nucera G, Gabrielli M, Lupascu A, et al. Abnormal breath tests to lactose, fructose and sorbitol in irritable bowel syndrome may be explained by small intestinal bacterial overgrowth. Aliment Pharmacol Ther2005;21:1391–5. Sullivan Å, Törnblom H, Lindberg G, et al. The micro-flora of the small bowel in health and disease. Anaerobe2003;9:11–14. Attar A, Flourie B, Rambaud JC, et al. Antibiotic efficacy in small intestinal bacterial overgrowth-related chronic diarrhea: a crossover, randomized trial. Gastroenterology1999;117:794–7. Bouhnik Y, Alain S, Attar A, et al. Bacterial populations contaminating the upper gut in patients with small intestinal bacterial overgrowth syndrome. Am J Gastroenterol1999;94:1327–31. Ferech M, Coenen S, Malhotra-Kumar S, et al. European Surveillance of Antimicrobial Consumption (ESAC): outpatient antibiotic use in Europe. J Antimicrob Chemother2006;58:401–7. Hart AL, Stagg AJ, Graffner H, et al.Gut ecology. London: Martin Dunitz, 2002. Tally FP, Stewart PR, Sutter VL, et al. Oxygen tolerance of fresh clinical anaerobic bacteria. J Clin Microbiol1975;1:161–4. Hamilton I, Worsley BW, Cobden I, et al. Simultaneous culture of saliva and jejunal aspirate in the investigation of small bowel bacterial overgrowth. Gut1982;23:847–53. Fried M, Siegrist H, Frei R, et al. Duodenal bacterial overgrowth during treatment in outpatients with omeprazole. Gut1994;35:23–6. Stockbrugger RW, Cotton PB, Eugenides N, et al. Intragastric nitrites, nitrosamines, and bacterial overgrowth during cimetidine treatment. Gut1982;23:1048–54. Funding: This study was supported by the Swedish Medical Research Council (grant number 13409), and by the Faculty of Medicine, University of Göteborg. Gut 2007; 56 741-741 Published Online First: 22 May 2007.